Aside from adjusting your make-up or clothing in order to make your face appear slimmer, or actually losing weight (which may cause your skin to sag), there are simple minimally invasive cosmetic procedures which may be used to change the shape of your face in order to give a slimmer and more attractive look. Face slimming techniques usually involve Botox®, Fillers, or skin tightening procedures. In Asian faces, Botox is often injected into an over-developed masseter (the muscle used for chewing) in order to cause it to decrease in size, making the lower jaw appear narrower and the face slimmer. When Fillers are used for facial slimming (as in example on the right), they are usually injected into upper mid-face in order to pull-up the cheeks making the face look slimmer. Additionally, injecting Fillers into the chin would elongate the chin and cause the neck to look slimmer as in the example below. Beauty is all about Proportion, Shape, and Symmetry. According to a study from the University of Nebraska, women with a smaller nose and chin, as well as a larger distance between the eyes and a smaller mouth width were deemed more desirable; however, the measurements and proportions between them, as well as the overall geometry, have to be just right for a face to be perceived as “beautiful”. The symmetry of your face can actually be measured. The ratios include the length of your face divided by the widest part of your face, the distance from line drawn between your lips to tip of your chin divided by distance from same line to your nose, the thickest part of your lower lip divided by that of the upper lip, and so on. The “magic number” seems to be the “Golden Ratio” of approximately 1.62, and the closer your proportions are to that number, the more “beautiful” you will be subconsciously perceived by those humans who see you. The shape and dimensions of various components of the face can be adjusted or “tweaked” to optimize size and proportions, often without surgery – with minimally invasive cosmetic procedures using dermal fillers, Botox, laser, and radiofrequency technology. 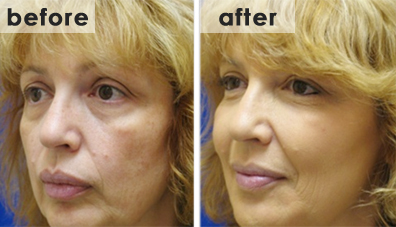 – Fillers in the upper face created a desirable fullness and “pulled-up” the cheeks. – Filler injected into chin caused a desirable elongation of the chin improving the proportion in the lower face; it also created an illusion of a slimmer neck. 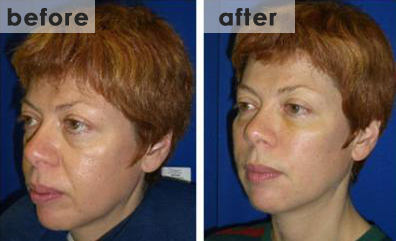 – The desirable “V-Shape” to the face between eyes and chin was restored. 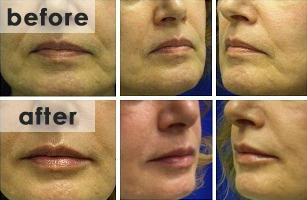 Filler injection in the upper mid-face restored the volume lost due to aging. 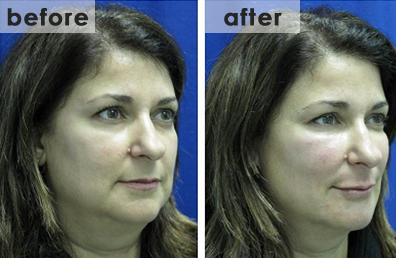 Filler injected in the chin and along lower jaw had restored a proportion on the lower face closer to the Golden Ratio. Again, the desirable “V-Shape” to the face below eyes was restored . Again, Filler injection in the upper mid-face restored the volume lost due to aging and alleviated the “baggy appearance” under eyes. Filler injected in the chin and lower jaw had improved the proportion on the lower face closer to the Golden Ratio. Once again, the desirable “V-Shape” to the face below eyes was restored . Here, the filler injection into Lips, Naso-labial folds, and Chin helped to restore some of the volume lost due to aging.